Flights can be diverted for many reasons. Bad weather, mechanical problems, strikes, armed conflict and natural disasters can cause a flight diversion. Airline pilots may also divert flights because of disruptive passenger behavior, passenger or crew health issues, or legal issues that involve passengers. When your flight is diverted to another airport, you will face one of two situations. Either your flight will resume when conditions are favorable or your flight will end at that airport and your airline will arrange for you to reach your destination by other means. If you have a connecting flight, you might miss it, depending on how much time you have between your originally-scheduled flights. Flight diversions are unexpected events, but there are things you can do before, during and after your flight to minimize a diverted flight's impact on your travel. Plan your departure for early in the day, if possible, so that you will have time to get to your destination even if your flight is diverted. For important events, such as a family celebration or cruise ship departure, plan to arrive at your destination at least a day early. 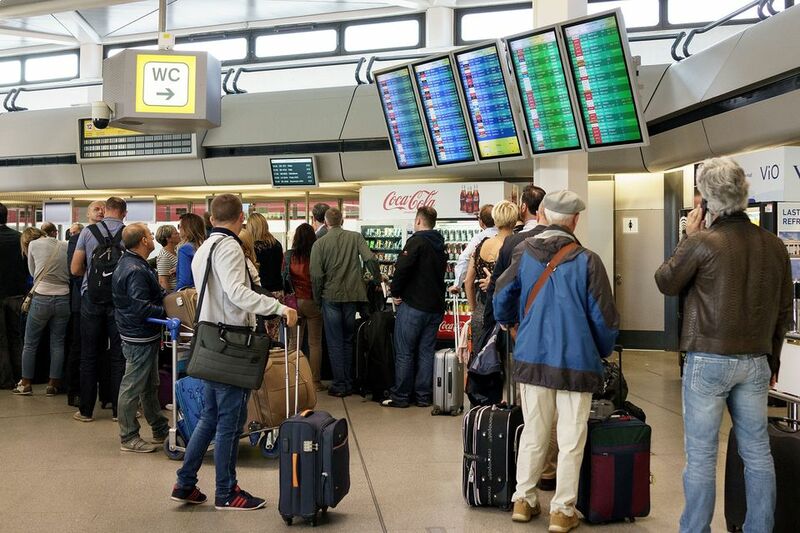 Flying nonstop will not protect you from all of the effects of a flight diversion, but you will not need to worry about missing a connecting flight. Before you fly, find out what your airline's Contract of Carriage says about diverted flights and passenger compensation. If your flight is diverted, you will know what you can expect from your airline and will be able to insist upon your rights as a passenger. If your flight is diverted, you will need your airline's telephone number and Twitter handle so that you can make contact with customer service representatives as quickly as possible. Bring a fully-charged cell phone that you know how to use. If you are traveling to another country, you may need to borrow, rent or buy a cell phone that works in all the countries you will be visiting, including those in which you will be changing planes. Bring a portable cell phone power bank, too, in case you get stuck on hold while calling your airline. Be sure to pack the things you must use each day, such as medications and contact lens solution, in your carry-on bag. In addition, pack a toothbrush, toothpaste, change of underwear and anything else you might need for an unexpected overnight stay. Tell someone that your itinerary has changed, especially if you are expecting to be picked up at your destination airport. Airline personnel will make informational announcements at your departure gate. Stay within hearing range so that you do not miss any updates. Pull out those contact numbers and call your airline. Ask for an update on the situation and find out whether your flight is realistically expected to take off within a few hours. If the diversion will significantly impact your travel plans, ask to be placed on another flight to your destination. You can also use social media to contact your airline and ask for help. Losing your temper will not solve any problems. Everyone on your flight will be feeling stressed, including you, but you will get more useful information and quicker assistance from your airline if you keep your cool and politely ask for help. Passengers on European Union airlines or who are flying to or from EU airports are entitled to specific compensation amounts under Regulation 261/2004, depending on the length of their flight and the number of hours they are delayed. These rights are limited in the case of extraordinary circumstances, such as a strike or weather problem. Passengers on US-based airlines must negotiate directly with their airline in accordance with the terms of their airline's Contract of Carriage. Canadian passengers must work directly with their airlines, based on the terms of their Contract of Carriage, but also have some recourse through the Flight Rights Canada code of conduct. If your flight on a Canadian airline is diverted, you may file a complaint with the Canadian Transportation Agency, which will help you resolve your issue. In general, Canadian and US airlines cannot be held responsible for flight diversions due to Acts of God, such as storms or volcanic ash clouds, or by actions of a third party, such as a strike or air traffic control issue. Is your carry-on prepared for baggage loss or trip delay?